Color Match is a product that we have engineered. In this process, we apply a concrete based micro topping. Once we have a nice clean slate, we apply color that is matched to your design scheme. After color has been applied, we apply a coat of heavy duty epoxy to give you a tough, one-of-a-kind, designer floor. 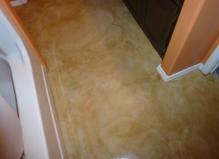 Diamond Crete is our system of penetrating color and sealer. The advantage of the system is that there is not anything on top of the concrete to wear off. It is a low maintenance and economical.